I only recognize one good-looking Ferrari one-off in recent memory and that’s the SP38. The rest of them mostly just look like they are wearing some new paint and have a few body modifications. 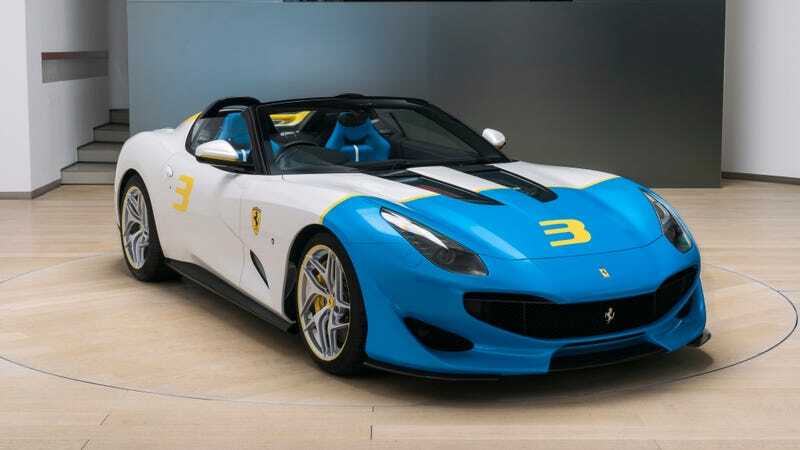 The same goes for this new Ferrari SP3JC one-off. From the outside, it wears a big blue face that looks like it smashed headlong into a can of paint bouncing down the highway. The new, front bumper has been molded to have the shovel face-look of the Group B Audi Quattro S1 rally car, which isn’t a bad look. It’s unique, to say the least. The SP3JC was commissioned by a collector. It uses the chassis and running gear of an F12tdf—but it has no roof. In the back, it has horizontal, gill-like slashes which make it look wider. Beneath the long hood rests the naturally aspirated, 770-horsepower V12 engine. What is unclear, however, is the significance of the number three painted on the hood and on the flank. What is this the third of? What does it mean? Are there two other brightly colored Ferraris in this owner’s collection? Does this SP3JC make up one point of a one-off Ferrari trifecta? Perhaps this car is a tribute to Woody Harrelson’s character in Zombieland, a zombie-slayer who delighted in painting a big “3" on large, beefy, American SUVs. Or maybe the owner just like the number three. We may never know.